For the British scholar, see William Shedden Ralston. William "Billy" Chapman Ralston (January 12, 1826 – August 27, 1875) was a San Francisco, California businessman and financier, and was the founder of the Bank of California. William Chapman Ralston was born at Wellsville in Columbiana County in eastern Ohio, son of Robert Ralston III and Mary Wilcoxen Chapman. He was known as "Chap" when he was young. With riches derived from Nevada's Comstock Lode,:237 he became one of the richest and most powerful men in California. He founded the Bank of California and was known for having a nothing-is-impossible attitude. He built Ralston Hall in Belmont, California as a summer home, however his wife Elizabeth "Lizzie" Fry and their four children were to have lived there all year round. Listed on the National Register of Historic Places, and it's now part of the campus of Notre Dame de Namur University. His dream was the construction of the Palace Hotel in San Francisco, California at the corner of New Montgomery and Market. He spent $5M on its construction, draining his banking empire in the process. John Painter Gaynor, was the architect and had been instructed by Ralston to study European luxury hotels for inspiration. The hotel opened on October 2, 1875. The hotel had early elevators or "rising rooms" and electric call buttons in the rooms. The hotel survived the 1906 earthquake, but was destroyed in the fire that followed. It was rebuilt and reopened in 1909. There is still a Ralston Room in the hotel, off the main corridor to the left. 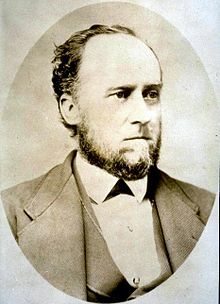 In 1871, following a severe drought in California, he initiated work on the surveying for an irrigation scheme in the San Joaquin Valley, and his lobbying was successful in securing the passage through Congress in 1873 of an Act to set up a Water Commission to advise on the irrigation of California. He was also involved in Philip Arnold's diamond-mining hoax of 1872. The day after the collapse, his body was found in the San Francisco Bay. He was the victim of either a stroke during his regular swim or suicide. :190 About 50,000 people were said to have watched his funeral procession, and 8,000 of his friends were said by Robert Brereton to have attended the public meeting held in Union Hall on September 8, 1875 to express the community's loss. His partner, U.S. Senator William Sharon, acquired many of his assets, including the Palace Hotel and Ralston Hall. Ralston Avenue is one of the principal roads in Belmont, California. Ralston Street in Reno, Nevada is named for William Ralston. There are Ralston Avenue exits from both Highway 92 and Highway 101. Ralston Middle School, Ralston Hall, and the William Chapman Ralston Award are all named for him. A small mining town in southwest New Mexico was named Ralston City in honor of William Ralston, its largest investor, but has since been renamed Shakespeare. The town of Modesto was to be named for Ralston; he declined, however, and it was called Modesto as one of the Spanish-speaking workers at the naming ceremony for that town said he was "muy modesto" or very modest. Modesto is home to Ralston Tower, an 11-floor building for the elderly. It is the second-tallest building in the city. Ralston was portrayed by Ronald W. Reagan in a 1965 episode of Death Valley Days, "Raid on the San Francisco Mint." The episode dramatizes an 1869 event in which Ralston gets the head of the mint drunk in order to persuade him to authorize an exchange of bullion for coins. Vaughn Taylor was cast as financier and adventurer Asbury Harpending. In a 1968 Death Valley Days episode, "The Great Diamond Mines", narrated by Robert Taylor, the role of Ralston was played by Tod Andrews, who is deceived by two prospectors who claim to have a functioning diamond mine in the desert. ^ a b "A celebrated history". Ralston Hall Mansion. Retrieved 6 August 2011. ^ "Captain William Chapman Ralston". The Maritime Heritage Project. Retrieved 6 August 2011. ^ Pierce, J. Kingston. "The magician of San Francisco". zPub San Francisco. Retrieved 6 August 2011. ^ a b c "Matters Historical: Making do with the lesser mansion". The Mercury News. 2016-12-17. Retrieved 2019-02-10. ^ "California Historical Landmark #86: California Theatre Site in San Francisco". noehill.com. Retrieved 2019-02-10. ^ Bevk, Alex (2014-03-24). "A History of the Palace, San Francisco's Oldest Surviving Hotel". Curbed SF. Retrieved 2019-02-10. ^ a b "Palace Hotel: A San Francisco Historic Hotel". Palace Hotel, San Francisco. Archived from the original on 7 August 2011. Retrieved 6 August 2011. ^ Harned, Richard (2009). The Palace Hotel. Arcadia Publishing. p. 53. ISBN 9780738559698. Julian Dana (1936). The man who built San Francisco. "Ralston, William C." . Appletons' Cyclopædia of American Biography. 1900. Mrs. Frank Leslie (1877). "Chapter XII: A Prince and a Palace". California: a pleasure trip from Gotham to the Golden Gate. (April, May, June, 1877.). New York: G. W. Carleton & Co. pp. 124–128.